For Local Production of Whole Grain or Reduced Bran Tawny White Flours! *Originally developed at Washington State College and recently updated by WSU Design Clinic teams. 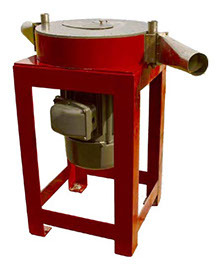 Instead of grinding the grain (stone mill) or shredding & sifting the grain (roller mill), the Unifine Mill is a type of impact milling system (similar to a hammer mill). The system pulverizes the grain on impact - resulting in minimal starch damage, and a more optimum and uniform flour particle size, compared to flour produced by other systems. The rotor and stator are extremely durable and offer long-term, dependable milling.